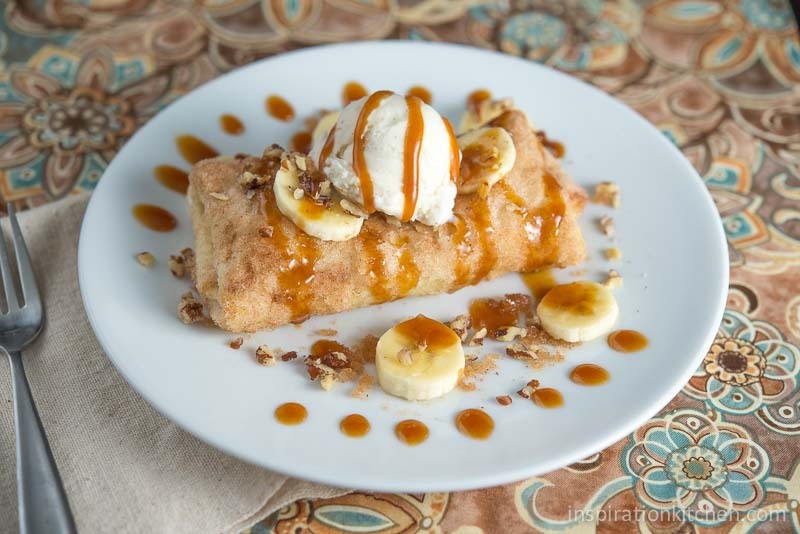 This Caramel Banana Xango is a rich, creamy Banana Cheesecake filled pastry, rolled in cinnamon & sugar and topped with ice cream, bananas, walnuts and drizzled with caramel sauce! I have good news! Did you know that Mother’s Day on May 11th is also Eat What You Want Day? 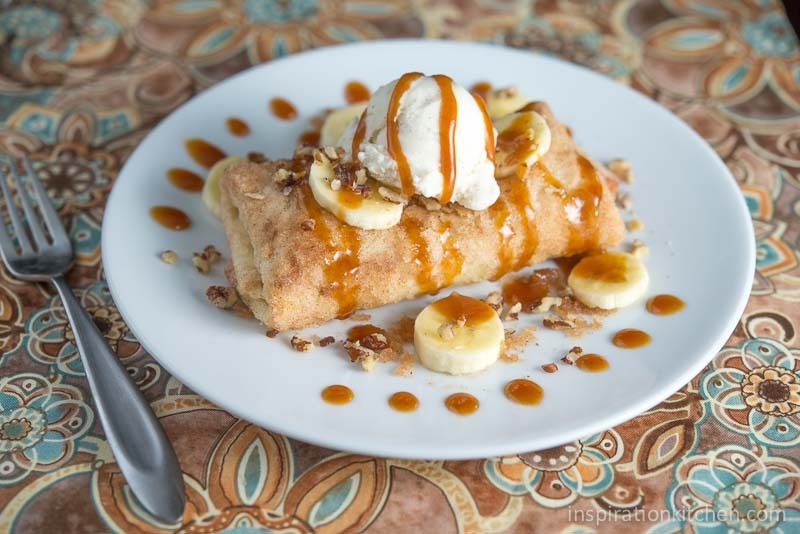 Now, I want you to get good and ready – because we’re making this absolutely fantastic and totally addictive Caramel Banana Xango! Honestly, as I’m sitting here writing this and eating this for breakfast, I almost feel like I should be arrested for inappropriate table manners. I am moaning in culinary ecstacy with every single bite. It’s just that good. Let me give you the back story… Years ago, after an exhausting and vigorous golf game, my husband and I would go to Gordy’s restaurant to indulge in their mouth-watering steaks and a potato with all the fixings. What we were really doing though, is trying to get through the meal so we could have a Caramel Banana Xango for dessert. It was heaven! Unfortunately, Gordys is long gone, but I’ve never forgotten that dessert! Which gets me to the reason I am having it for breakfast. I realized I simply couldn’t live without one of the best things I’ve ever eaten. And, if I was going to have it again, I’d have to make it myself. It was the same day I learned Mother’s Day is also Eat What You Want Day. Coincidence? I think not. The tortilla will puff up while you bake it and is pliable and chewy, not flaky like a regular pastry. It gives great contrast in texture to the creamy center! There are bananas in the cheesecake filling, as well as bananas on top, so the banana cheesecake filling has a predominant banana flavor. And when topped with homemade caramel sauce – it’s amazing. Try it! You won’t be disappointed!!! Place cream cheese and sugar in a mixing bowl and mix on medium to medium-high speed. Add vanilla and mashed banana until thoroughly mixed. Place a generous amount of banana and cream cheese mixture down the center of each tortilla, leaving a 1" space between the top and the bottom of the tortilla. Fold in the top and bottom ends at the 1" mark, then roll the tortilla, sealing all sides. Gently secure tortilla with a toothpick. Brush tortillas on all sides with melted butter and roll all sides (and ends) in cinnamon and sugar mixture. Place on a parchment lined cookie sheet several inches apart (tortillas will puff when cooked). Bake at 350 degrees for 15 minutes. Remove from oven. Place tortillas on a serving plate. Top with one scoop of ice cream, sliced banana, chopped walnuts and drizzle with caramel sauce. My first thought was, “what in God’s name is a Xango?” This thought was quickly followed by another equally pressing question, “how quickly can I make this? Because I clearly need this in my life!” Banana cream cheese filling? Cinnamon sugar! homemade caramel! Yuuuummmm!! Oh and I don’t give a hoot that Mother’s Day is “Eat what you want day” because around here, that’s everyday! 😉 Buuuut my mom will probably want to know, so I’ll pass that fun fact along to her! Lindsey I seriously ALOL (actually laughed out loud ;-)) at your comment!!! I think my neighbors probably thought I was crazy laughing outside (by myself) today on my patio. Yes, it is absolutely THAT nummy. I’ve had it several days in a row now and I have to admit, I’m not ashamed to say it was always for breakfast! I think we need to start a “thing” – ALOL could be the next big acronym! Can you TM an acronym? I’m pretty sure your neighbors already thought you were weird for eating a Xango for breakfast several days in a row…just sayin’. Why don’t I have any tortillas in my fridge right now?!!? Life is so cruel! I know, right? 😉 Crazy good! You’ve also given me the best news, which I will share with my family right after I finish typing. Mothers’ day…I can have what ever I want!! Oh yeah! Glad you love it – and YES, be SURE to tell your family that Mother’s Day is not only YOUR day, but that you get to do EXACTLY what you want!!! Cheers my friend, and thank you so much for the pin!!! I’m gettin’ on my eatin’ pants and joining you, Kristi — this looks too good to be true! 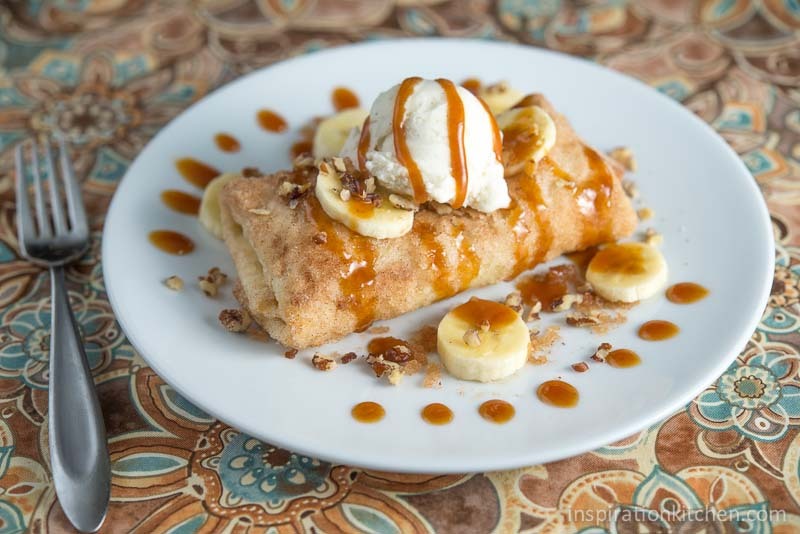 Bananas, caramel, cream, and a sugary tortilla? I’m so in. Pinning! Hahahaha! I actually LOL’d at the eating dress – I’m with you Monica!!! I’m with you! Delicious is not enough to describe this! My mouth is seriously watering… haha! The cheesecake filling sounds to die for. And I love how you plated it! Very elegant! Kristi, thank you for introducing me to a xango! I’ve never seen or heard of one before, but geez it’s about time. Banana cheesecake, cinnamon, sugar, ice cream, caramel…hello?! Can it get any better? This looks like such a special treat, I’m just imagining how decadent it tastes! Thanks Dina – it is! 🙂 I hope you try it! I think you’ll love it. Hahahaha! I actually LOL’d at this Johlene – I LOVE the way you think! Mango, Tango, Xango! Love it! They all sound so festive!!! Oh My Godness! This does look like the best thing I’d ever eat indeed! So much awesomeness in such a cute package. I love love love this! Thanks Consuelo – although I think a few exercise runs are in order after this! 🙂 Cheers, my friend! Oh my — this looks incredible. I love bananas and cheesecake, and of course cinnamon is delicious with almost anything. This looks like such a fun and creative dessert/breakfast/anytime snack. Can’t wait to try this! I’m so glad you like it Jamie – it is really, really good – you won’t be disappointed! Hahaha! I love my eating pants! I think they’re made for recipes just like these! I don’t think I’ve ever used tortillas and turned them into something sweet. These look right up my alley though. Love the flavor combo. Have a beautiful Wednesday Kristi! The tortillas worked perfectly for this Melanie! They puffed in the microwave and made the perfect packaging for the banana cheesecake goodness! Have a beautiful week! Oh, bananas and caramel! Sounds divine! And you rolled the tortillas up so perfectly. I’m a hot mess when it comes to that. Pinning! Thanks for the pin Christin! Have a beautiful week! Hi, Kristi! These honestly sound amazing. I think this is fantastic that you had this for breakfast on ‘eat what you want’ day. We foodies need to support these things, after all. And … you’ve presented it sooo nicely. I love the little caramel ‘dots’ you have at the front! Thanks Helen! Those dots were after several attempts at trying to do something fancier! Hahaha! Have a beautiful week! Eat What You Want Day sounds like an amazing holiday!!! And I DEFINITELY want to eat these… holy yum do they look delicious! I’m so glad you like it Jess! Just say ‘yes’ to Eat What You Want Day! Hahaha! Have a beautiful week! Haha I wear my “eatin’ pants” every day of the week! Maybe that’s why I now am re-commencing operation stop being a fatty. Man, I just love to eat! Doh! Why didn’t I think of that!!! It’s totally perfect for Cinco de Mayo! Thanks for the pin – and the Doh! moment! Hahaha! Oh gosh, this looks delicious! And it’s so pretty too! With the caramel .. I mean I can never say no to caramel. I can see why you’d eat this for breakfast! Caramel – one of my favorite things – no matter what time of day it is! 🙂 Have a great week Ashley! This looks so good it should be illegal! The banana’s cancel out the sugar, right? It’s basically like eating a fruit salad? Because that’s what I’m telling myself! Umm, yum?!! This looks so pretty, and the caramel is driving me crazy in the best way possible! I love this unique dessert Kristi! Oooo. I love the use of the tortillas here! And wow. Yes. Eatin’ pants – those are called Fat Pants in our house. I’m rolling them out now. . . . This looks uh-mazing! Thanks Sara – they are definitely fat pants worthy! 🙂 Have a wonderful weekend! Totally agree! Mother’s Day is also Eat What You Want Day. And I’m aaaaaaall about it. 🙂 This looks amazing. Love bananas and cheesecake. I need to make this happen! Rather, my husband and boys need to make this happen. For me! Exactly! I love the way you think Ashley! I hope that you make this! Have a great weekend! So glad you like it Kathy – I’ll join you and we’ll both indulge! 🙂 Have a great weekend! Never heard of Xango but I’m totally in love with with a Cheesecake filled pastry… Amazing dessert! Thanks Daniela! The cheesecake part is pretty amazing! Have a great weekend! My, this does look amazing! What a combination, banana, cinnamon, sugar, and cream-cheese! I think I have an idea of what to do for my mom on Mother’s Day! Thanks! I have to admit – this is a good one. Addictive and sigh. Fabulous. 🙂 Have a great week Renee! Woah! Now this is a dessert I must have ASAP. That caramel sauce is calling my name! Hahaha – I know, right? You’ll love this dessert Ashley! I would love to have this dessert for Mother’s Day. What fantastic flavor and crunch. Thanks Christie – this is one of our favorite desserts – it is amazing! This looks great. I won’t be serving it for Mother’s Day, but possibly my husband’s birthday that is a few days after–his favorite flavors! I’m so glad you like it Kristen. It’s one of our very favorites! Have a great weekend and a fabulous Mother’s Day. Wow! That looks like my kind of dessert! Great for Cinco de Mayo! Thanks Cynthia – we absolutely LOVE this dessert. So rich and decadent, so I’m glad you like it!